Hello everyone, happy new year! Hope you’re all having a great start to 2013 so far. So what’s my actual opinion after trying these? I really don’t like them. The first thing that annoyed me was access to the fluff, I had to use a knife to cut open the plastic to be able to get the fluff as it wouldn’t come out of the small holes in the plastic which took me about half an hour to do, so annoying! Then there’s the application, it’s so messy. I painted my nails with Barry M Strawberry Ice Cream and then dipped it into the fluff and tapped off the excess and patted down to smooth it over then left it to dry. After around an hour when I had allowed them to fully dry I looked down at them and was actually happy with the outcome, it looked really good and so different to anything I had done on my nails before. The one thing I was worried about was how they where going to look after getting wet when I wash my hands, so I tested it out. This is when it all went down hill. It changed colour when I washed it and it just wouldn’t go back to it’s normal colour after it was dry and the nail varnish underneath was really noticeable. It then started going really lumpy and just looked so horrible, I really wasn’t happy with how it looked. I had had enough with it and took it off. The removal was the best part. 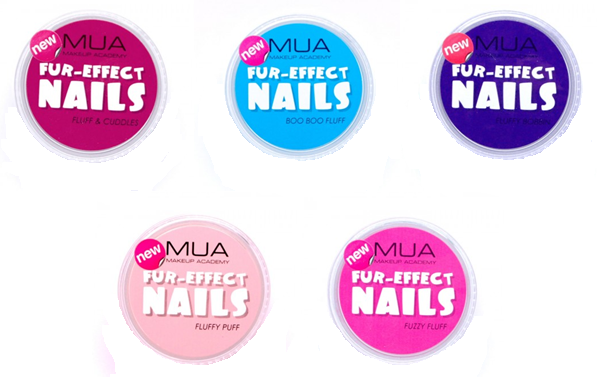 Sorry MUA for such a bad review but this product is just awful and I won’t be buying any more of these Fur Effects again. Have you tried these? What’s your opinion? If not would you try these?